Large deciduous shade tree, attractive serrated leaves, long spikes of white flowers in Summer. Bears edible nuts. Chestnut trees thrive in deep, free draining, fertile and friable soils in sunny sites protected from hot winds and receiving plenty of moisture. Highly tolerant of cold. PLANTING INSTRUCTIONS Tolerant of average soils but succumb to root rots in wet soils. 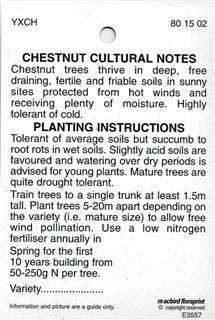 Slightly acid soils are favoured and watering over dry periods is advised for young plants. Mature trees are quite drought tolerant. Train trees to a single trunk at least 1.5m tall. Plant trees 5-20m apart depending on the. variety (i.e. 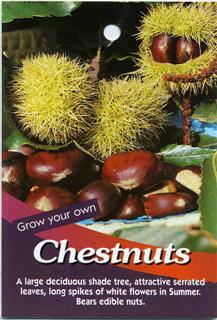 mature size) to allow free w.ind pollination. 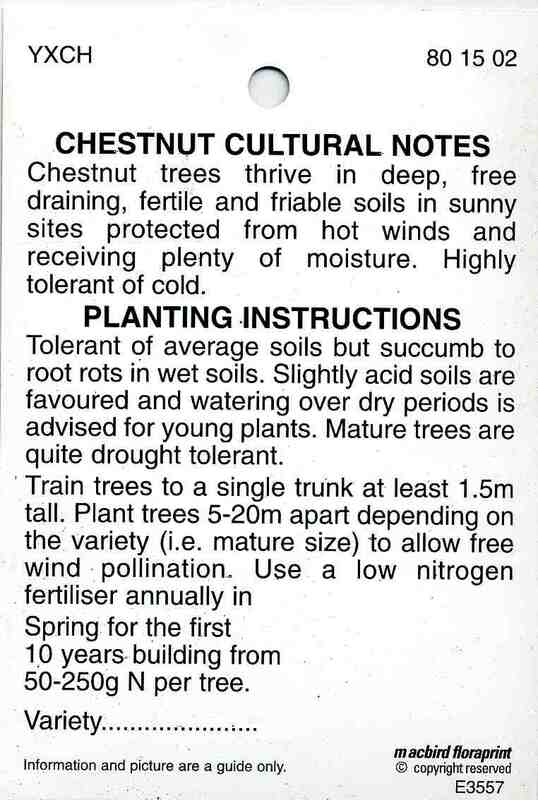 Use a low nitrogen fertiliser annually in Spring for the first 10 years building from 50-250g N per tree.